A little while ago we asked you to fill out a survey all about the contents of your make-up bag, and you most certainly delivered! 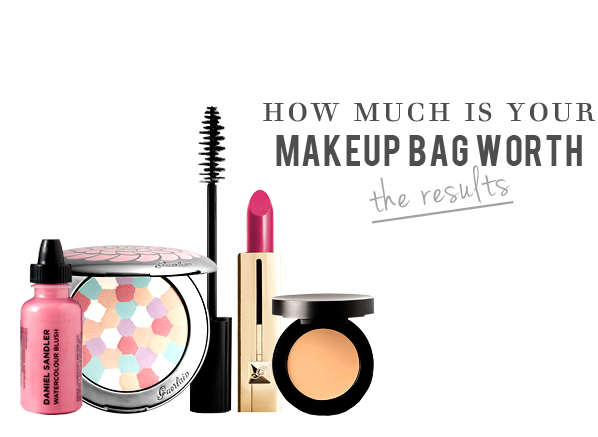 Around 2000 of you divulged the ins and outs of your collection in our ‘How Much Is Your Make-up Bag Worth’ survey, from how much you spend on your make-up purchases every month to how highly you rank those purchases amongst your other outgoings. A quarter of all respondents spend £30 to £60 on their make-up bag every month, and more than three quarters admitted to spending the same or more on their make-up bag in 2012 than ever before. Over one third of all respondents have spent upwards of £15 on a lipstick – around one in 5 of whom have spent more than £25! Respondents don’t feel the need to splash out on an expensive brow pencil or lip liner – a massive 48% spend less than £5 on their brows, 57% spend while an even more impressive 67% spend less than £5 on their liner. Eyeliner is an area where we don’t spend too much, though we’re not willing to scrimp either. 38% of all respondents spend anywhere from £6 to £11, saving the bulk of their eye budget for a great mascara. Our foundation is one of the most important commodities in our make-up arsenal. The majority of respondents, 31%, have a foundation worth £17 – £27, although 2% of respondents have spent £56 or more! We’re more willing to scale back on the price of our concealer than our foundation, with the majority of respondents stating that they spend £6 – 11. The amount we spend on our eyeshadow (including palettes) is pretty manageable, with 40% of all respondents spending less than £16. We’re more willing to splash on bronzer than we are on an expensive blusher, probably because there are so many shades! The survey showed that our average spend on blusher is around £17, while for bronzer it is £20.50. We also offered a £20 voucher for one lucky entrant, and the winner of the prize draw was C Westbury! This entry was posted on Monday, January 21st, 2013 at 5:41 pm and is filed under Make-up, Special Post, Survey. You can follow any responses to this entry through the RSS 2.0 feed. You can skip to the end and leave a response. Pinging is currently not allowed.